The program, "Grounds for Change," is based on a report from The Economist entitled "Oil in Your Coffee" which highlights little known uses for used coffee grounds including creating biodiesel fuel. 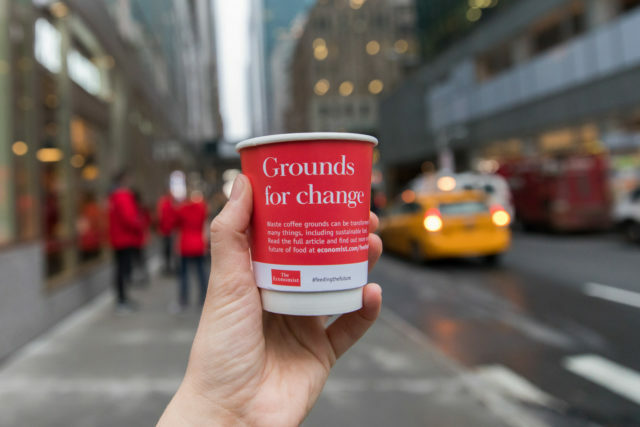 Beginning on March 18 The Economist will have its branded coffee cart at various locations throughout New York City to offer passersby a free cup of coffee and to highlight innovative uses for the used coffee grounds. The program, “Grounds for Change,” is based on a report from The Economist entitled “Oil in Your Coffee” which highlights little known uses for used coffee grounds including creating biodiesel fuel. The report notes that annually, world coffee demand consumes more than 7m tonnes of coffee, which could produce some 340m gallons of biodiesel. The report also notes that 1 litre of biodiesel requires 5-7 kg of coffee grounds, depending on the oil content of the coffee used. Those stopping for a cup of coffee may choose one of two post-consumer uses of their grounds. Option one: the grounds are transported to a compost site and transformed into a fertile soil amendment for use on local urban farming and gardening projects. Option two: upcycle the coffee grounds with a Brooklyn-based company utilizing post-brewed coffee grounds to create soaps, scrubs and candles. “The campaign brings The Economist’s mind-stretching journalism to life and challenges potential readers to consider new ideas and solutions to reflect on more environmentally sustainable approaches towards food production and consumption,” said Marina Haydn, senior vice president Circulation and Retail Marketing. The experiential marketing strategy is a part of The Economist’s live content marketing program that aims to attract new readers to The Economist through creative and provocative real-world experiences. Most recently, The Economist introduced consumers to its “Waste Not. Want Not” program. The program offered pedestrians smoothies made from produce otherwise destined for the trash – illustrating that ugly, wonky or bruised fruit and vegetables rejected by supermarkets can still be eaten and taste great. Consumers who participate in the “Grounds for Change” program will have the opportunity to subscribe to The Economist at an introductory rate of 12 weeks for $12 and as a special gift can opt to have The Economist plant a tree on their behalf. 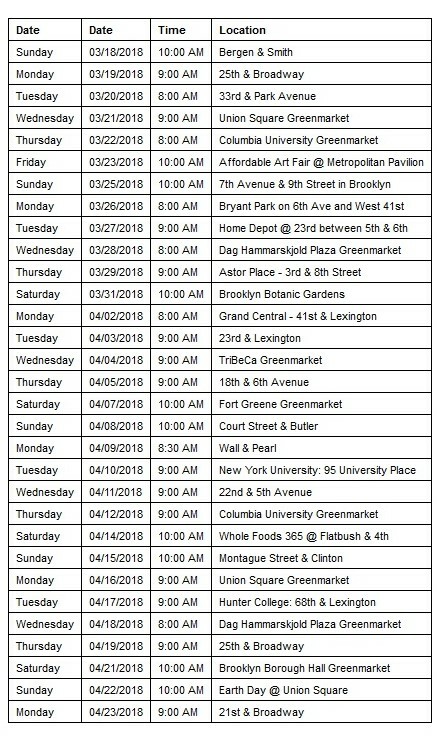 The “Grounds for Change” program kicks off on Sunday, March 18th at Bergen and Smith Streets in the Boerum Hill section of Brooklyn, and will wend its way around the city during the months of March and April. Below is the schedule of activities for the next several weeks. Locations are subject to change and more dates will be announced as they become available.